Here we are, Week 2 of the One Room Challenge! For any new readers, the One Room Challenge is a biannual decor and design event that takes place every spring and fall. This Fall 2018 Challenge marks its fourteenth season! Each Challenge there are 20 designers selected to transform a space, and they document their progress each Wednesday during the event. In addition, anyone with a blog can take part as a Guest Participant. Each Thursday the guests post links to their progress, inspiring and encouraging others as they participate. And that’s me, a Guest Participant! 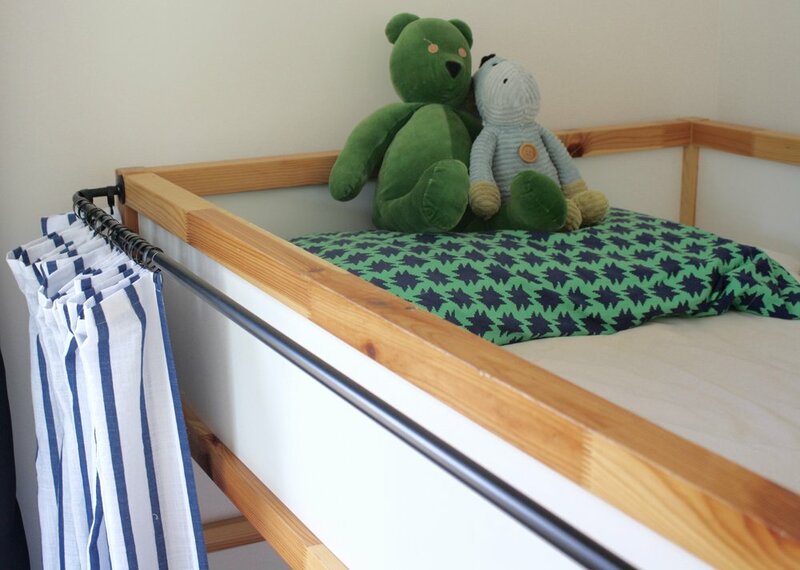 I’m making over my boys shared bedroom, giving it a touch of whimsey and lots of function. I love stripes. Stripes in clothing, art, fabric, wallpaper … in moderation, of course. I have one throw pillow with black and white stripes, several black and white or blue and white striped shirts, and have now added blue and white striped curtains on the boys’ loft bed! Someday came much sooner than it usually does, as I decided to participate in the One Room Challenge just weeks later. A light bulb came on, and I realized it would be the perfect fabric for curtains on the KURA loft bed. It is lightweight, but falls well. The boys have blackout curtains, so with fun being the only mission I could really use any fabric I chose. It seemed meant to be, as the stripe coordinated perfectly with the rest of the decor plan I had in mind, and with almost 7 yards at hand I had plenty! Even though I didn’t want to “blackout” the bed, I did buy curtain rods from Walmart that are meant for blackout curtains. Instead of hanging on a straight rod, the curtain clips can move all the way to the side, to sit flush with the mounting hardware. It’s the best option for hide and seek! I couldn’t find black cafe clips, only oil rubbed bronze or nickel, so I went with the ORB and spray painted them black. All told, including fabric, rods, and clips, this project cost under $40. I already had the spray paint. And by that I mean, look up a tutorial on how to sew a hem, and then follow their directions to hem your fabric to the size you need. There are a billion sewing tutorials out there, and they are all MUCH better tutors than me, so YouTube it up, friends … feel free to comment if you have any great tutorials to share! I’m outsourcing here! For the KURA bed, once the rod was mounted and clips hung, I needed the finished curtains to be 43.5 inches long. I hemmed the top first, and then used the very scientific method of marking my ironing board with a pencil to know where to fold the bottom hem up to. Miraculously, this non-method worked out, and the curtains are the perfect length. This afternoon I tried out the curtains. I hid in the bottom bunk with my 9-year old, and pulled both curtains closed. Of course, no one knew we were hiding. And the other kids were outside. That might have had something to do with it. Can’t make everyone happy. It’s not her room, so whatever. I painted the room over the weekend. On Friday the kids had a couple friends over, so they played out in the backyard all afternoon while I frantically painted the trim Benjamin Moore’s Decorators White. Then on Saturday I painted the walls and ceiling Benjamin Moore’s Classic Gray, mixed half-tint. Not sure how I got it done in one day, because I spent most of my time at Home Depot. First for paint. Then back for a roller. Because I forgot to thaw the roller I had in the freezer that was saturated with half-tint Classic Gray from when I painted my bedroom in August and ROLLERS DON’T THAW FAST. Then back for more paint, when I realized I definitely couldn’t get away with one coat. Long day! But I’m married to a saint, so he wrangled children and it got done. There you have it. The first full week of the One Room Challenge is over, and it seems I just might get this done! Next up, a makeover of their KALLAX storage unit. I bought wood today, so here we go!